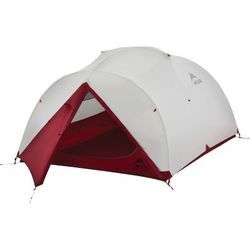 MSR Mutha Hubba NX 3-Person Backpacking Tent. New for 2019. MSR's best-selling, freestanding 3-person backpacking tent reinvents lightweight livability. With a floorplan that offers each occupant easy access to doors and gear, the MSR Mutha Hubba NX tent is the ideal tent for a trio backpacking deep into the Sierras in the heat of summer, or tackling the Appalachian Trail for an extended trip in the spring. Upgraded with premium features, including virtually indestructible Easton® Syclone™ poles and MSR’s durable Xtreme Shield™ waterproof coating, this tent is built to last like never before. Easy-to-assemble and with plenty of interior volume for three, the Mutha Hubba NX offers the most livable accommodations for 3-season conditions.